Vastu is ancient Indian science which considered space as a living person & propagated ideas with respect to the human soul. 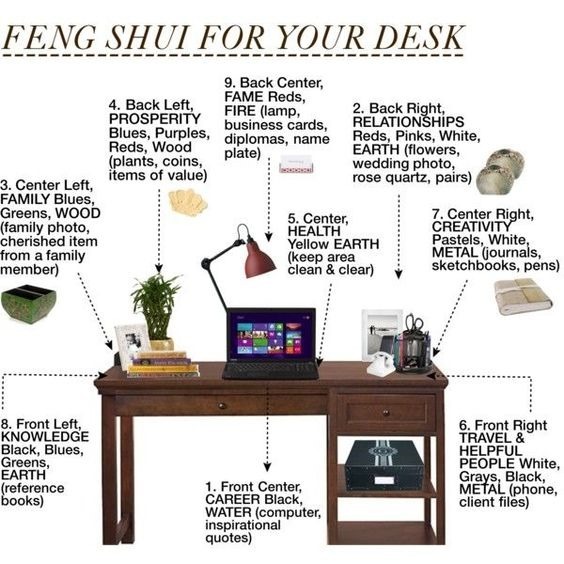 Feng-shui is more of a nature & surrounding based science of space organisation. Every ancient science speaks of the science in planning & the art of organisation. Starting with the entrance, keep the entrance to your space a little mild & light in terms of colours & decoration. Excessively done doors / entrances might reflect bad aura if not done rightly. Keeping bright but mild tones avoids interiors as well as Vastu/feng-shui blunders. Decide a main focus aisle of the office & keep it clear i.e. free of clutter. Use plants to break the radiating work tension/pressure from other areas to create pockets of life [ good aura]. Avoid using dark colours as they emit negativity [also they emit heat scientifically & are bad light reflectors]. Add positive elements that are soothing like wind chimes. You could use some inspirational quotes posters. However avoid pictures of people other than your family that might be on your personal desk. In case of general spaces, some people might like some photos while others might derive negative vibes from the same. De-clutter your desk space & organise your work pads/ computers. Use cheerful positive decorations/ décor elements. 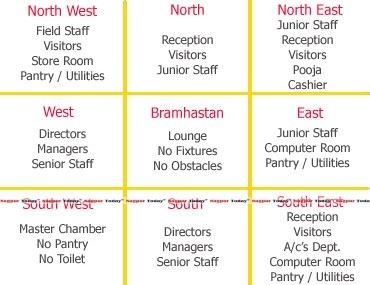 Implement these tips…….use a bit of Vastu…..a bit of feng-shui & a lot of science & build a better place!! This entry was posted in Architect's Pick and tagged feng shui, interior design, office interior, vaastu, vaastu for offices, vastu. Bookmark the permalink.